Dibya, Adibya, p. 1976. From the University of Chicago Library. ଦିବ୍ୟ ଅଦିବ୍ୟ Dibya, Adibya by ଜାନକୀ ବଲ୍ଲଭ ମହାନ୍ତି Janaki Ballabh Mohanty. 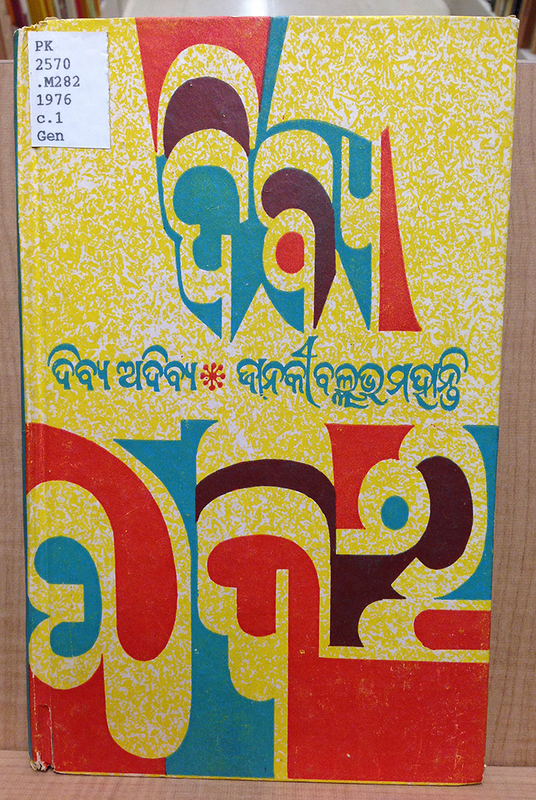 I have no idea what the title means, or what this book is about, or any information about the author, but it was in the Odisha history section! It took me a second to register the rotation of the letters of Adibya! Interesting colorblocking! I like that the designer is using the paper color of the book as the “positive” space of the title letterforms. I miss screenprinting!